Husband, father, grandpa, great-grandpa, and uncle, passed away November 20, 2018. Bill was born September 28, 1928 to Marie (Brisbane) and Clyde Sagvold in Starbuck, MN. He grew up in Cyrus, and Morris, MN, graduating from Morris High School in 1946. Bill enlisted in the Army after high school and served in Ascom City, Korea for 2 years. He was especially proud of the hand to hand combat training (jiu jitsu) he received in Korea where he was part of an elite Military Police Corps. Afterwards, Bill attended Luther College until as an army reservist he was called back to duty for one year at Ft. Sill, OK. 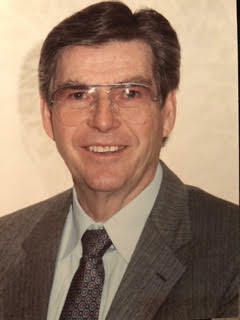 He graduated from Luther College in January, 1953 with a BA degree in Business Administration and went directly to work for Luther College as a recruiter. While at Luther, Bill and his band (the Pastels) auditioned for a summer gig at Yellowstone Park, they were awarded the contract and spent three months playing nightly at the Mammoth Springs Lodge. Bill played the saxophone and sang vocals. He was a walking encyclopedia of songs, and artists, especially jazz. These band members remained lifelong friends. While at Luther, Bill met and married Enid Erickson, his life-long partner, with whom he celebrated their 65th Anniversary in June of this year. Bill had interesting and varied careers over the years. When he and Enid decided to move west, he began work as an investment advisor for IDS in the Tri-Cities. Later, as a Trust Officer for Nat'l Bank of Commerce, Rainier Bank, Old Nat'l Bank, and U.S. Bank, his career took him to Yakima, Edmonds (where he worked in the Rainier Tower downtown Seattle), and lastly to Spokane where he lived until his death. His final career and passion was as a realtor for Tomlinson/Black in Spokane where over the years he served many repeat clients and was proud to call most of them friends. He gave up his real estate license at the age of 80. An avid outdoorsman Bill enjoyed hunting, fishing, and skiing (water and snow), especially with his four children, encouraging them in each of those sports. Always community-minded, Bill was instrumental in bringing the hydroplanes to the Water-Follies in the Tri-Cities, serving as Water-Follies President, and then as Benton County Park Board President in 1965. His volunteer activities were many and varied: Meals on Wheels, Camp Sweyolakan, and KSPS Public Radio and TV. Bill was past-president and member of the Kiwanis Club for over 60 years, and in every community in which he and Enid lived. He supported numerous colleges over the years and loved to watch the Zags play basketball. Bill loved meeting people...and particularly enjoyed finding a connection with them either directly, through family, or acquaintances. One of the highlights of his life was re-establishing contact with his Norwegian relatives and being able to visit the family farm in Kongsberg, Norway. His larger than life and optimistic personality will be forever missed by family and friends. Bill is survived by his wife, Enid; daughter Kristi Spohr (Marc); son John (Lynette); daughter Torre Dahl (Brad); and daughter Jean Simpson. He is also survived by 10 grandchildren, Kevin Spohr (Stacey), Kassie Tricola (Matt), Kayla Spohr, Lauren and Olivia Sagvold, Conrad and Kareena Dahl, Erick, Chad, and Grant Simpson and great-grandchildren Carson and Trent Spohr. In addition, he is survived by brother-in-law Hank Kosmata (Brooke) and niece Kristi Kosmata. Bill was preceded in death by his parents, sister Helen Reeve Kosmata and nephew Matt Kosmata. Bill wished to donate his body to medical research and was accepted by the Elson S Floyd College of Medicine in Spokane. Kramer Funeral Home has been caring for the family. A celebration of Bill’s life will be announced at a later date. In lieu of flowers, donations may be made in Bill's name to Kiwanis Downtown Spokane, KSPS, a Parkinson’s Foundation, or any charity of your choice. A Celebration of Life will be held on Sunday, March 3, 2019 at St. Marks Lutheran Church at 2:00 P.M., 316 East 24th Avenue, Spokane, WA, 99203.